Our office is proud to offer as a service to our patients traditional orthodontic care and Six Month Smiles. For most people, achieving a healthy, beautiful smile is the reason for seeking braces. If you're self-conscious about your smile, correcting your concerns with braces will greatly improve the way you look and feel. Crowded or overlapped teeth. The center of the upper and lower teeth do not line up. We understand the apprehension some adults and children may have toward getting braces. Before beginning your orthodontic care, we will discuss all of your options and provide an estimate for how long your full treatment may take. When your treatment is complete, you will have the smile you've always dreamed of and the confidence to show it off! We want you to feel comfortable and confident throughout your entire orthodontic experience, and our practice is dedicated to making sure that you receive the quality care you deserve. Our traditional braces consist of metal brackets bonded to the teeth. By placing a constant, gentle force in a carefully controlled direction, braces slowly move teeth to the proper position. The placement of bands and brackets on your teeth does not hurt. Once your braces are placed and connected with the archwires you may feel some soreness of your teeth for one to four days. Your lips and cheeks may need one to two weeks to get used to the braces on your teeth. They should not interfere with playing sports or musical instruments. Orthodontic treatment can be successful at any age. Everyone wants a beautiful and healthy smile. We are pleased to treat patients both young and old with braces. Twenty to twenty five percent of orthodontic patients today are adults. Treatment time varies and can last between one and three years, depending on several factors including age, growth rate, and the severity of the correction necessary. A big factor in a successful treatment is you! Maintaining good oral hygiene and keeping regular appointments are important in keeping treatment time on schedule. The more involved and diligent you are, the more efficient your treatment will be. A revolutionary combination of proven orthodontic techniques, modern materials, and innovative thought - Short Term Orthodontics utilizes nearly invisible clear braces to gently straighten and align teeth in an average time of just six months. We can use short-term orthodontics to provide fabulous smiles faster than with traditional braces. How can Six Month Smiles create straighter smiles so quickly? By focusing only on teeth that show when a person smiles, an aesthetic result can be achieved faster. Six Month Smiles is designed specifically for adults and older teenagers without major bite issues who have crooked, crowded, or unevenly spaced teeth. These quick braces work by targeting the appearance of your smile, not more complex issues like bite and jaw alignment. Unlike traditional braces people must wear for years, this procedure straightens teeth in an average of just 6 months and uses low force to move teeth comfortably. A faster result with quick braces does not mean extra pain! 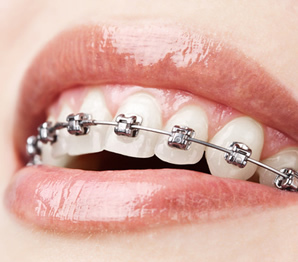 Also, six month braces use clear braces and tooth colored, nickel-titanium wires--making them virtually invisible. quick braces are both efficient and discreet. The Six Month Smiles process requires fewer dental visits and is typically less costly. If you have any questions about the quick braces process with call our dental office. For many patients, MTM Clear Aligner is an affordable alternative to traditional braces. This clear aligner system is designed to treat the most common minor misalignments of your front teeth. Unlike some clear aligner systems, MTM has a unique “open pathway” architecture which allows teeth to move easily and naturally into position. Plus, there are no unsightly attachments to the teeth, making treatment virtually invisible. This powerful clear aligner system works best for patients wishing to correct minor crowding, spacing or rotation of their front teeth. Patients whose teeth have shifted after braces are exceptional candidates for this system. Each clear aligner is custom fabricated using the latest in digital technology to ensure that tooth movement is fast and predictable from start to finish. Ask your dental provider if you are a good candidate for MTM clear aligners.